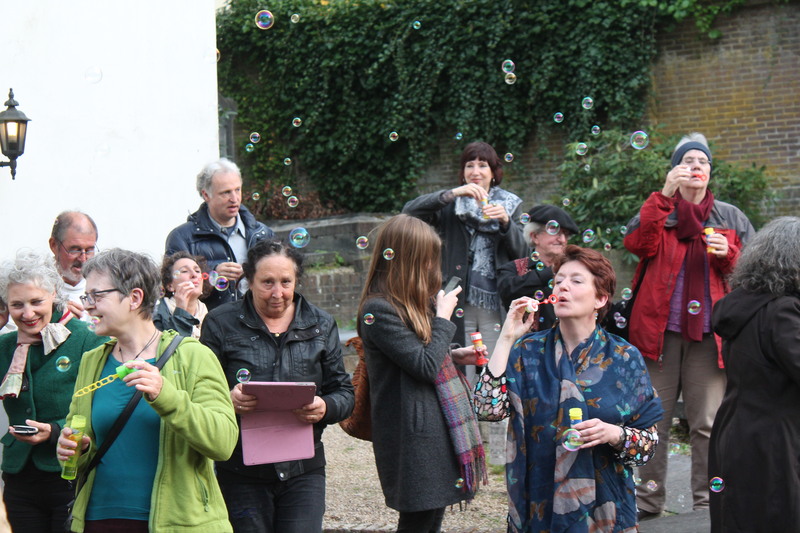 Again the International Blowing Bubbles Day took place on May 6. I do hope you all had a good time and moments like we did. This year three artists opened the day in Singapore: photographer Stephanie Oebeles-Kilian, Aileen Mitchell and Larisa van der Grinten Bons. During the day there was remembrance, fun, sharing, togetherness and cheer joy! In Deventer, Monsieur Bart was blowing bubbles during a walk. There was a gathering in Prague organised by Smíchologie CZ. Television and radio attention, people just on their own celebrated the day and made tweets and facebook notices about it as the St Antonius hospital in the Netherlands did when they were sharing bubble fluid to its patients and so one could say there have been several celebrations and moments of thought. The ending of the day ceremony was held in Ubbergen in the surrounding of Nijmegen in the Netherlands with a flash-exhibition of mail art and the art work of Marlieke Overmeer, Gerda Stevens, Annemiek Koolen, Lille Dresden, Szymon Przybylek, Carla Clevers, Ingeborg van Stipthout and Flip Looyen. The exhibition was accompanied by the mezzo soprano Ingrid van Ree, declamation of poetry by Peter Freijsen and of course lots of bubbles. A great day to me! The blog will remain the central point and we shall post everything here just like always, next to the Facebook page !